I belong to a group called the "7 Card Draw." 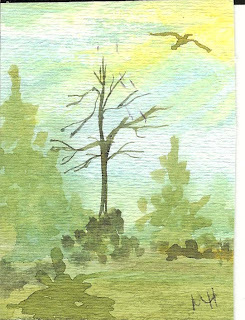 The members of this group do ACEOs, little paintings and/or drawings that are 2.5" by 3.5." 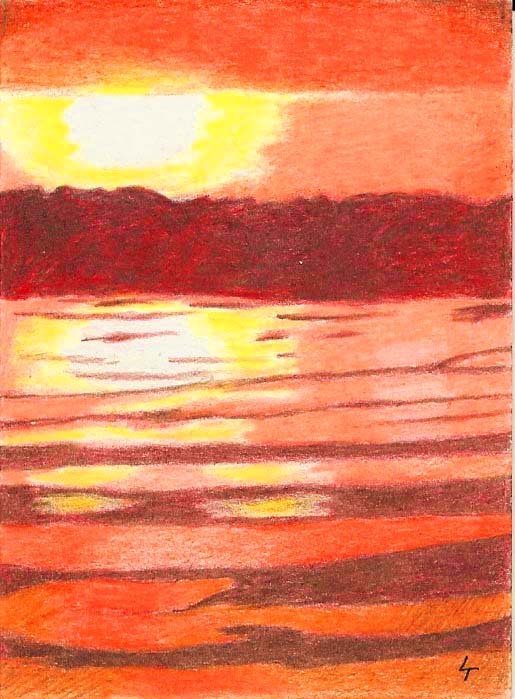 Each month, the leader of the group, Pam, picks a name of one of the members who then gets to pick 7 ACEOs from the pool. Watch for a future post about the cards I just won. For now I want to talk about another idea, the swap. 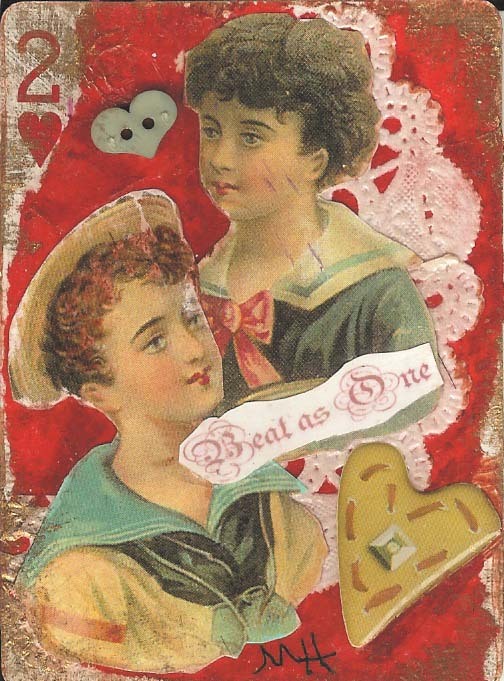 In a swap, all the names get put in a hat, and then are picked so that two artists are put together, and each one sends the other one, one or more ACEO's. 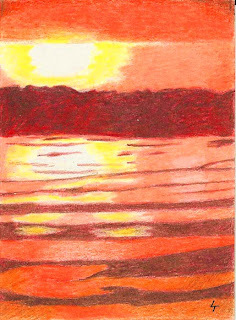 These are the beautiful ACEOs that Marlene did and sent to me. Aren't they lovely? Last year I put up a Winter Heart Tree, after taking down my Christmas Tree decorations. The origin of this idea was something I had thought about for a long time, but never mentioned out loud, until last year. Every year I would love having the Christmas decorations up and then feel so let down after they were all put away. Because then it was just grey and blah outside. I thought that I should create some Winter Hearts so I could celebrate Winter instead of disliking it so much. (Having handmade hearts on my tree was already a tradition.) So I mentioned this to my hubby and he loved the idea. I got busy and created lots of quilted handmade hearts in shades of blue and white. This year I added some baby's breath and silk flowers ... hope you like it. This year, the first thing I did was trim my tree. So I got out the big plastic box with the little dividers that holds all my precious ornaments and transformed our tree from a Fall Tree to a Christmas Tree. (For a picture of the tree, refer to the previous article.) But when I opened up the red box that holds my Christmas House decorations, the box was almost empty. My Christmas Hearts were not there. I was stunned. These hearts had been lovingly made by hand, quilted, some embroidered, and I used them to tuck into nooks and crannys, nest into bowls, and hang across the bookcase. I didn't know what to do. I went through both boxes again. I went through my box of Fall decorations. Then I began, one by one, to go through all the boxes of Christmas "Stuff" that I have saved but never display because there isn't room in the loft for everything. I came across a lot of wonderful memories, gave up a lot of them to go to Goodwill, but didn't find my Christmas Hearts. Somehow, I knew I wouldn't, but it was like I had to go through everything anyway. Then yesterday as I was walking through the bedroom, I got a very clear picture in my mind's eye of the upper cabinet of my computer hutch. I hesitantly walked to the hutch, not wanting to be disappointed again, but somehow, somehow, I had a feeling. And when I opened the hutch doors, there they were, all carefully packed and protected. Now they grace my living space, and it feels a little bit like a Christmas miracle. I won a "Give-away." What is a Give-Away, you ask? It's when an artist gives away one of his or her art works for nothing. I'm constantly amazed by how many artists do this. And I just won a Give-Away - my very first one. Some artists put their Give-Aways on their blogs, other on their FaceBook pages. You enter the Give-Away by leaving a comment. And I finally won! This little witch may have a secret. Is she a real witch masquerading as a child? Or a child masquerading as a witch? What surprises may she have up her sleeves? Whatever the answers, she will be a lovely little witch, going house by house to get her treats and perhaps leave a bit of magic. In case you haven't guessed, she is a good witch. 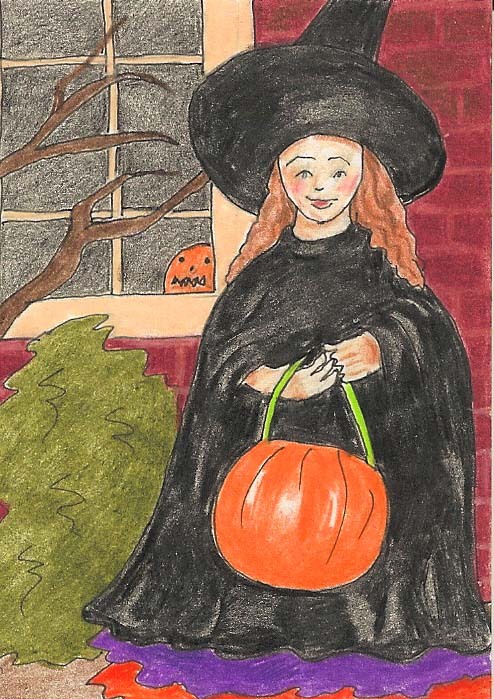 This little witch is an ACEO (Art Cards Editions and Originals) and is done with pen and colored pencils.